Do Any Cats Not Jump on Countertops? 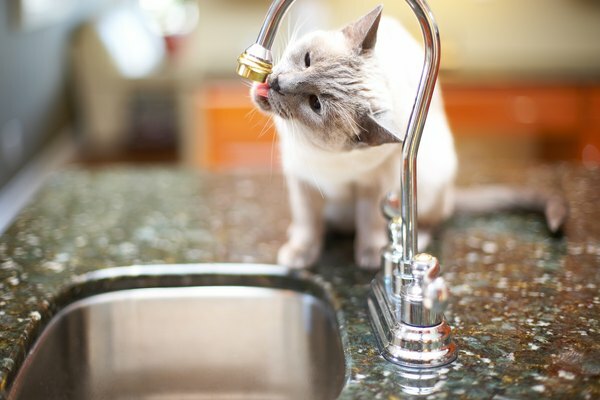 Giving your kitty water from the kitchen sink will keep him coming back. You never want to find kitty hair making a nest in your fruit bowl or dirty paw prints littering your counters, so countertops should be feline-free zones. Leaping up to your counters is a pipe dream for some cats, while others need a few deterrents to keep them off. Not all cats are blessed with long legs suitable for jumping from the ground to the counter in one smooth leap. Short-legged breeds, such as munchkins, Persians and some Himalayans, aren't notable jumpers. Their short back legs don't give them the same leverage as other cats, so they normally don't find themselves standing on tall counters. However, this is all relative. You're less likely to walk out into your kitchen and find a short-legged breed sitting on your counter, but that doesn't mean it won't happen. Don't leave chairs or stools pulled next to the counter, or at least push them all the way in, or your low-riding feline might find a way to reach the seemingly unreachable. Adopting a senior kitty from your local shelter doesn't only give the old feline a home, it also means you might not have to put up with a countertop cat. Older cats take a laid-back approach to life and often sleep more, so they're less likely to be running around, jumping onto counters and being destructive furballs. Seniors also often develop joint problems, usually related to arthritis, which can make a simple jump onto the couch difficult. If you do take in an aging kitty, be aware that you will likely be taking more trips to the vet and dishing out some cash for medicine as conditions pop up. If the kitty you bring home is able to reach the counter, it's difficult to deter him. All cats are jumpers, even the short-legged ones who can't leap as high, so preventing them from jumping altogether isn't viable or a good idea. But fixing up a little bobby trap can make your cat reluctant to put those little paws on surfaces they don't need to touch. Touch-sensitive training pads or strips send out a mild and harmless static charge. They don't hurt your kitty, but the sensation is uncomfortable and tells him the area is paws off. Throwing a bit of aluminum foil on the counter or laying double-sided tape is also uncomfortable and makes your kitty realize a trip to the counter isn't worth all the hassle. Some cats jump onto counters because they find bits and pieces of food, so always clean your counters and never leave food lying around. Sometimes cats act out when their food bowl is empty or when they want attention. If your kitty knows the countertop is off-limits, he may jump up there to grab your attention. Playing with him, cuddling with him on the couch or giving him his dinner is fine, but don't do any of that while he's on the counter. He'll learn if he jumps up there, he gets a reward, and that's a very difficult habit to break. What Are the Most Vocal Cats? What Is a Diluted Calico Cat?